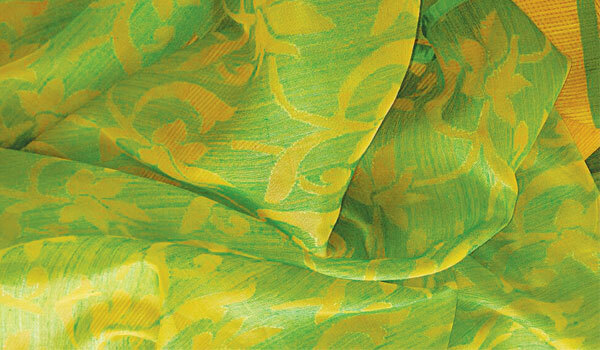 Introducing a range of graceful hand-spun silks, silk cottons and linens in time for the upcoming spring season, textile aficionado Arundhati Menon offers a striking palette of hues to mark one year of her label, Abha. Look out for sumptuous tussar saris which are lovingly hand-block printed and embroidered with Menona��s distinctive designs. a�?Ia��ve used the fish motif in this collection,a�? Menon shares. a�?The fish being a beloved motif in Bengal and a sign of prosperity.a�? Marked by both ebullient and earthy tones, one will find acute angles executed in hand-block prints in fiery vermilion to florals in sunny saffron. 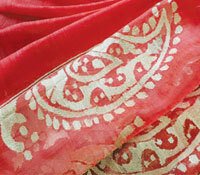 Also of note are the luxurious Upada silk saris in spicy hues of orange, rust, chutney green and more. a�?Ia�� m so overwhelmed by the fabulous response to Abha this past year. Each piece is handcrafted and can sometimes take months to complete.a�? And this is what inspires her to continue her remarkable work. Known for her passion for reviving and supporting handloom weaving, Menona��s keen interest in providing a platform for artisans has taken her from weaversa�� villages in Phulia, West Bengal, to chikan work specialists in Lucknow, Uttar Pradesh. a�?It is imperative that young people are aware of our rich textile variety,a�? the revivalist says. a�?Skilled labour is rare to find these days.a�? 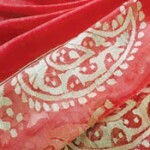 The kind of skill that has characterised her exquisite designs for the last 35 years. a�?The weavers are growing older and their children dona��t seem to be interested in continuing their work. Thata��s why ita��s so important for us to appreciate them and keep the craft alive,a�? she signs off.